I am what you call a little bit of a cook. I can cook and I have been known to cook but since I got sick I don't cook as much. So I sometimes watch cooking shows on tv but they got to be all the same and I got so very bored with them. Now there is this new show on ABC called the Taste and I have to say from videos I am seeing this is a show that I am going to enjoy for sure! I saw happy people, mad people, etc all in one video clip! The show comes on at 8 pm est on Tuesdays on ABC. Go and check it out here I love it and I think you will too. Give it a shot a few minutes of your time and I think you will have a new show to watch. Giveaways are usually not my thing. There are so many people trying to win that you feel you have no chance. I still enter them every time but I usually never expect to win any of them. Its like the lottery there is no real fool proof plan to ensure that you are going to win over anyone else. 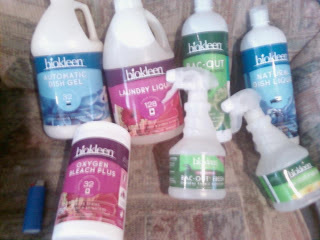 So the day that I signed up for the Biokleen giveaway I was sure that I would not win. So when I got an email back right before Christmas I was more surprised then a kid at Christmas. They never tell you exactly what you are going to win so I couldn't wait to see what all was going to come. When a big box showed up at my door that I could barely carry that said Biokleen on the side I couldn't wait to tear it open and find out what I had gotten. Also when you are in the freebie world you are use to samples just little things you can try once and form a slight opinion of but not the best opinion. So when I opened the box and I saw full sized bottles I couldn't believe my eyes. I had never used a Biokleen product before so I wasn't sure what I would think. Torn between being honest and being appreciative of the things that I had won I realized that I must do a review saying how happy I was to recieve what I had. Any company that will give out full sized productshas to think that people will love their products and tell the whole world what they thought. With that said I can't be happier with my box of stuff but I have to say what I really feel so that is what I am about to do. I hope that BioKleen does not take offense to what I say or feel that I am ungrateful for the gift that I received. Let's go on a BioKleen learning lesson where I tell you my opinion and hopefully you will get some of your own so you can form your own opinion of their products. Masks are usually for Halloween, they are scary and they make your face sweat and warm. Something only good for one day of the year at the most. 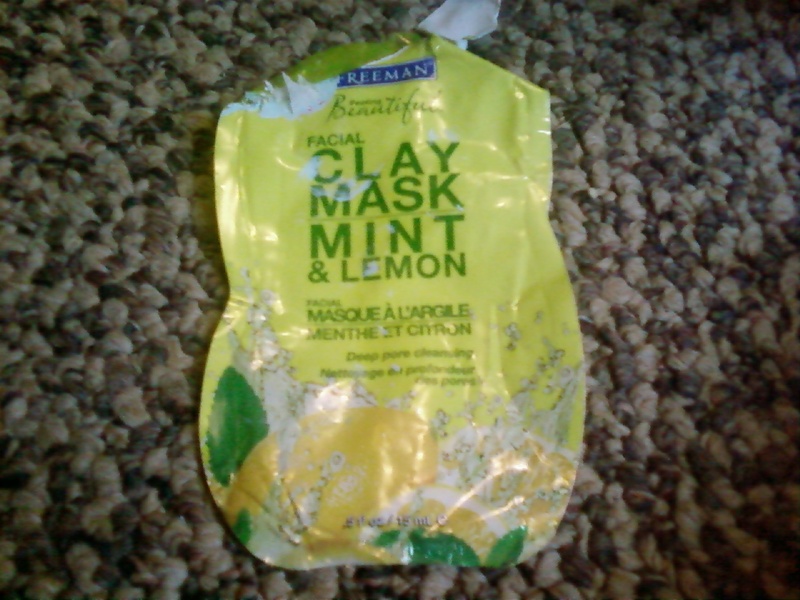 The Freeman mask though this mask is good to be used every single day of the year. Unlike the masks of old this is the mask of the new generation. Some people don't like the feeling of putting something on their face that is going to get all hard where they can barely smile and I use to be one of them. I decided to try this one out after I got it for free in the mail. Right away when I got it I loved the colors and the picture on the packaging. It is a forgettable picture but that is perfect because it makes you give it a 2nd and 3rd look and it keeps it on your mind. Last night I had an amazing night planned out for the Hubby and I very sweet and romantic. I cleaned the house up and cooked an awesome dinner. I put this mask on before I started cleaning and let it do its magic. It doesn't tell you how long to keep the stuff on your face only until it is dry and then wipe off with warm water. When I cut it open I smelled a wonderful mint smell and I loved the pretty green that it came out as. It wasn't too thick or gritty and went on very well. It did take a little bit to wash off of my hands. After it got hard and I got done cleaning I went and washed it off..at first I thought it was going to wash off really well but I had to use a towel to get most of it off so I had a washed face and a dirty green towel. It was then that I thought I was going to hate it for sure. After my shower and daily routine (Lotions etc) I started looking at and feeling my face and I gotta say I don't think I have felt any softer before. Not sure how this product works but it really does work. Its not something I will throw on with my husband around but definitely something that I will add to my beauty routine while he is at work. All and all it helped to smooth my face better then any other mask or lotion I have ever tried. Next time you have a date or you just want to freshen up your face pick one of these up at the store. I'm not sure on the price but it can't be too much and is worth it. Also I don't know how many times per week or month that you are to use these but I think I will use this a few times a week. My Hubby seemed to really enjoy my new softer face and I didn't tell him why it was softer. This will be one of my little secrets that all women seem to have. As a freebie lover I have gotten little samples of everything but have never really gotten to see how well something works because there is only one application in every little cardboard home. I can understand that companies will send these things out to get the interest up for their product without sending too much of the actual product out. This is a big turn off for me because if I can't have a few applications of something to see if it really works or not I am not shelling out the money for the product. Also as someone who doesn't wear make up all the time I want a product that can speed up the application process which I find boring. I love the after results I just hate getting there and with all the different powders and foundations out there I was putting on so many extra things taking up so much extra time and making me dislike make up even more. I got a full sized BB cream from SheSpeaks to try out and review and I have heard some about this product but not too much. Always see the commercials and the magazine ads but they never really explain what happens or how you use the product or even really what it is for. I didn't understand until I read the applicator and even then I still was not sure so I went and did some research on the product. After I wash my face and dry it I opened up the applicator and put some BB Cream on my finger then put dots all around my face to make sure I would have enough while also not using too much. 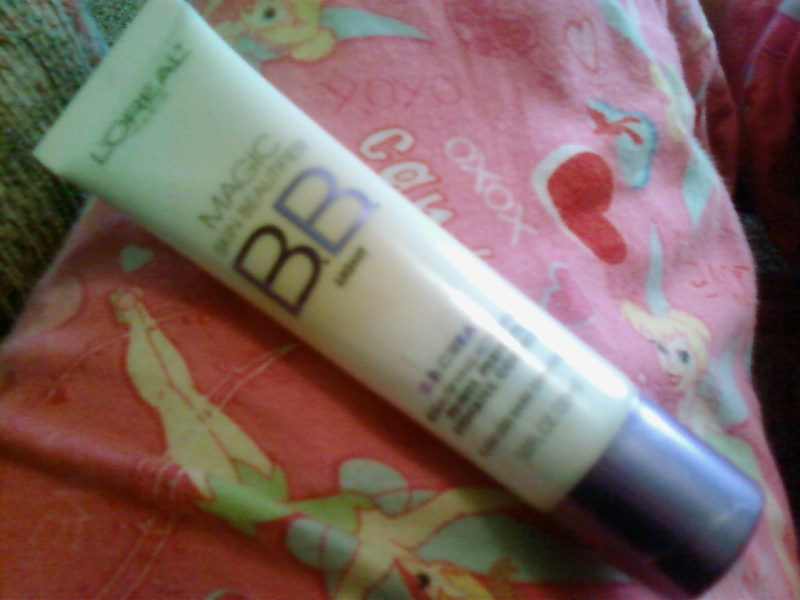 It applies evenly and really covers up the spots that I had to use more then one make up product for before. Then I applied my regular make up and the results were so much better then usual. I looked almost natural still not like I had make up caked on my face in any way. Some how my face felt better lighter even not as heavy and I felt younger as I looked as myself in the mirror. It also washes off very easily and I didn't have make up hands as I call it. I haven't checked on prices but I am sure as all make up is that this is an expensive product but worth it. If you think about it the price is probably equal to the prices of the other powder and foundations that you will be replacing. So the price thing will balance out and it lasts a long time because you only need a little bit to get some great coverage. I recommend everyone to try this it really worked for me. Some people won't feel the same way as I do and that's ok because it's a good thing to read the good and the bad about any product. If you are a freebier and you have a few cardboard applications of BB Cream sitting around get those babies out and try them. If you have enough of them use one every time you put on your make up in place of your regular foundation or powder. I think you will fall in love with this product as well! I got this for free from SheSpeaks so I could try it out and review the product. I will not and haven't received any money from SheSpeaks or Loreal Paris for my views and/or opinions. Everyone needs energy and some need it more then others do so they decide to buy the shots or the drinks like Monster or Red Bull. With the way this world progresses it was only a little time before they decided to try new ways to get you energy like inhaler looking things or patches. 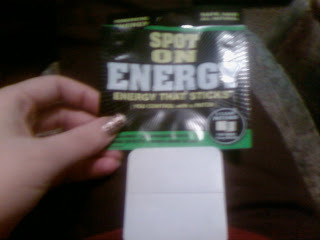 When I signed up for a free sample of Spot on Energy patches I was not too sure on how they would work or if they would work at all. I can't do much of the energy products because my hearts starting beating really fast, I get warm, and I almost feel like I am going to pass out but I get no energy whatsoever from them. My husband is a true energyaholic. He is always trying to find that next way to stay awake and alert at work. Bubbleberry Rockstars are his new choice and believe me he is addicted to them but they don't do what they are suppose to do. He can and has drank 7-9 of them in a day and still was falling asleep while watching tv or movies. So I grabbed his arm and stuck a patch on it. I didn't tell him what it was for or what it would do because I needed an honest answer. The package says that they should last about five hours per patch so I watched the clock while I read up on the rest of the information that might need to be known. It is safe and all natural with no calories no side effects and made in the USA. The first thing I saw was the word homeopathic. In my family that means some kind of crazydrug that is suppose to be better for you then "real" drugs. Usually homeopathic does not work. It is nice though that you won't have to taste some nasty drink IF they work. I watched my husband for a little while playing Call of Duty Black Ops 2 and nothing seemed any different. Didn't look like he had an extra or new energy or that the energy he had was increasing in any way. After a bunch of questions from him I finally told him what the patch was and what it was suppose to do. He said that he felt nothing from it and it didn't help him at all. The patch was starting to irritate his skin after awhile but he stuck it out the full five hours hoping for some much needed energy. I have to wonder though with someone who is so dependent on energy drinks and such would he be a good one to try this product? From what he told me this product is not worth buying or trying, but I think I am going to try this out for myself and see if I have any other opinions of it like maybe it will work for me. I am not holding on to that wish though but if by some miracle it does work for me I will make another review on these and share my findings but for now I wouldn't spend the money to buy something for energy that does not provide any energy to you. Maybe some day they will find a good tasting, good for you, and actually working form of energy that will be safe for everyone to try and to fall in love with the energy that doesn't ever seem to go away. Even with the crappy picture above you can still see the basic structure of the bottle, the images, and what color the liquid is inside. I love the fact that they make these bottles so pretty and sleek. We always wash our hands in the bathroom but I love to have a soap bottle out by the kitchen sink just to make it look pretty. I haven't had one in awhile so I was happy to this in my brand challenge box. It is Softsoap Pampered Hands and the smell is called Jasmine Oasis. It is a foaming hand soap which I think are better then regular hand soaps because of all the foam/bubbles that it produces. My oldest decided she knew what it was for and didn't read the bottle and put some into her hands and rubbed it in. She thought it was that germ stuff that you clean your hands with. I waited for a few minutes and asked her what she thought of it. The smell was good and it really made her hands soft she said. This made me interested to try it and find out how it worked when used with water like it is suppose to be. I have to say I have never been so excited to wash my hands. Its the weirdest feeling to be so excited to try the strangest things when you are a online reviewer lol I got the water all warm and wet my hands and then squirted some in my palm. It instantly reminded me of flowers and I loved the smell right away. This is the smell I am use to when it comes to soaps. I wish companies would realize that sometimes the new and weird smells are not going to sell as well as the ones that people are use to. It didn't take much for the smell to fill the area I was in which was just perfect. From the first time I used this hand soap I was impressed. 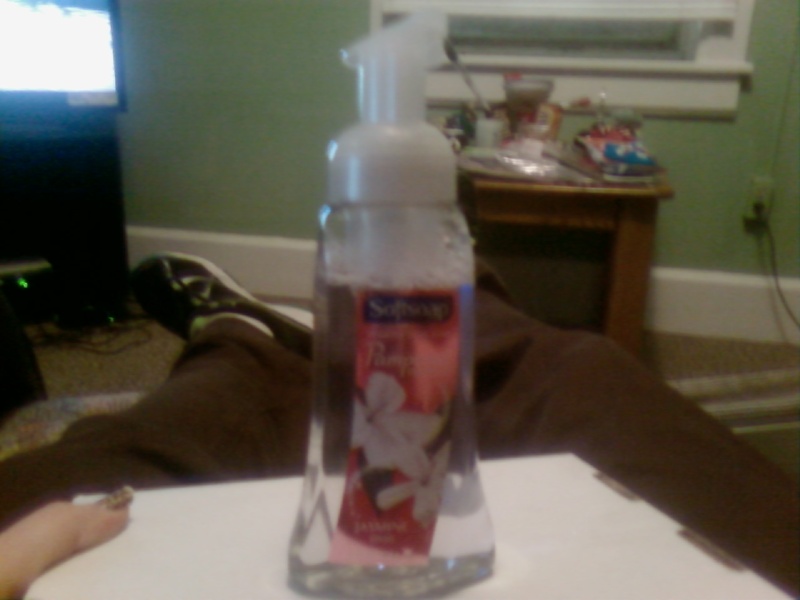 Softsoap is a brand I know well and a brand I trust for hand soap. I do recommend this it works well, has a great smell, and it doesn't leave your hands feeling dry over used or sticky in any way. The benefits are not only for your hands though the smell can leave a section of a room smelling lovely for a little while at least and I used it to wipe up my sink when I was done washing my hands and it even left a shine on there! I may have to move this soap into the bathroom and find a different one to "decorate" the kitchen with. I got this product for free from Influenster and was not and will not ever be paid for anything I am reviewing it in hopes that others liked it as well as I did and can recommend some other products to me and so that people who never tried this can find out what it is all about and maybe fall in love with a new product. It is fun to think that I may be influencing someone to reach out of the box and try some amazing things! When you hear the name Softsoap what do you think of? I think of hand soap that you wash your hands with or that sits on your kitchen sink mostly for decoration. I never would have thought about body wash. I don't know how "new" this product is but it is brand new to me. Which if I have never heard of it how many others haven't as well I wondered. How much advertising could they have done? People who don't associate Softsoap with body wash may have a hard time shelling out money for the product. With that said on to my review. I found out that I was a Palmolive Brand Challenge Winner through Influenster and I was super excited! For the next few days I was thinking I was going to get more dish soap because I am running low haha. I then took the time to read the email and spoke with a few of my freebie friends and found out that it was not dish soap at all but a box of a few other things. 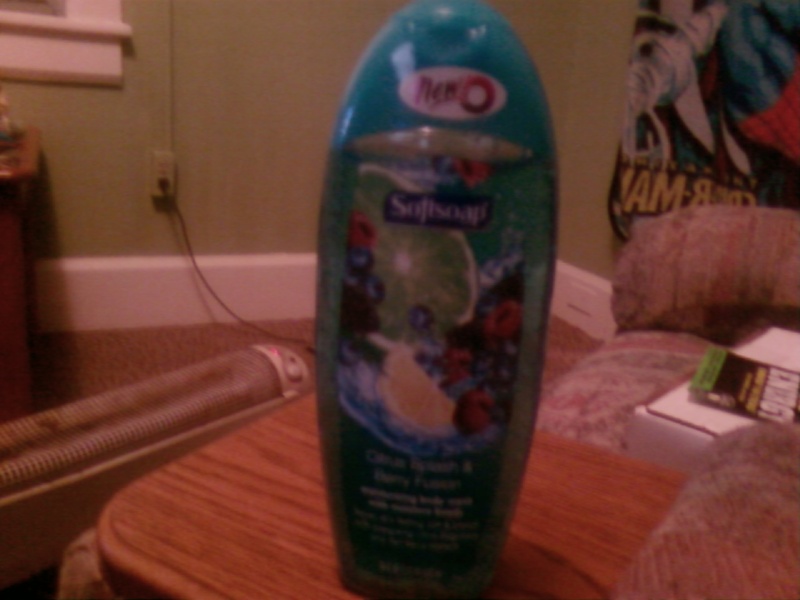 I got the Citrus Splash and Berry Fusion Softsoap. It's an 18FL OZ bottle bigger then what I expected and I don't think they come much bigger then that. I then had my thought from the first paragraph but it made some sort of sense now though.How better to get people to try out and get their product out there then to give it to a bunch of people who try out new products and tell everyone they know and the blogging world. Which would get people to buy their product without spending a whole lot of money on advertising. Anyway, before I will use/try/take anything I will read everything that is on the label and find out exactly what I am dealing with, in this case it sounds pretty good. Moisture beads that leave skin feeling soft and smooth with an energizing citrus fragrance and real berry extracts. This product is suppose to leave you soft and smooth and give you energy. So with all that learned I was going into this expecting this product to do what it says it will. It has an interesting smell but not really a good smell. It is one of those that you can't really place it and you might use it for hand soap or maybe an air freshener but for your body I'm not so sure. But I will always follow through so I went in to try it out. The first time I tried it I needed some bubbles for my bath and wanted to see just how bubbly this stuff would get. What few bubbles it made didn't stay long and the smell didn't seem to last very long either. When I was done and got out I expected to feel something from it but I got nothing new from my usual body wash or bubble bath. So the first test was failed all the way. The next day I got in the shower and put this product on my loofa. This time I could smell the fragrance better then before it was a little better smell then the fresh from the bottle smell. I put some on the loofa after wetting it under the water and the amount that I put on there was enough to cover my whole body. The soap bubbles don't stay on you very well just like earlier when I used it in the bath. I got out, dried off and then went to do my usual routine. When it came time to put on lotion I felt my arms and stuff and they did seem pretty smooth so I decided not to put on lotion and see how I felt the next day. I was not smooth anymore actually I felt almost dried out. The smell goes away almost as soon as you put it on and I did not feel energized at all. If you are going to use this product it does work but don't skimp out on your routines as well. Always use some sort of lotion maybe a scented one after you shower so there will be some sort of smell that comes from it all. I will use the rest of this bottle and if it gets better I may buy more but so far it is not impressing me like my last bottle of body wash. If nothing impresses me I won't spend the money to buy another bottle. They need to work on the product more then the packaging and the fancy words they use to express their product. I am a bit dissapointed with you on this one Palmolive. I am not willing to go from that awesome new dish soap to this so so body wash. I received this from Influenster for free with no compensation only the hopes that I will review it and tell others what I thought of the product so that maybe they would go out and try it for themselves and have a different opinion then I did.